Lieutenant-Colonel Thomas John Todd, a 41 year old Accountant and Boer War veteran from Newcastle Street, Perth, Western Australia, enlisted on the 2nd October 1914 into the 10th Light Horse Regiment. The 10th Light Horse embarked from Fremantle, Western Australia aboard HMAT A47 Mashobra on the 8th February 1915 for Egypt. Having actively participated at Gallipoli, the defence of the Suez Canal and subsequent campaigns in the Sinai the Light Horse were moved towards Palestine. Todd was wounded in action on the 19th April 1917 during the Second Battle of Gaza where the 10th suffered their heaviest casualties since Gallipoli. The regiment went onto take part in the Battle of Beersheba and the follow up actions that lasted until early January 1918. 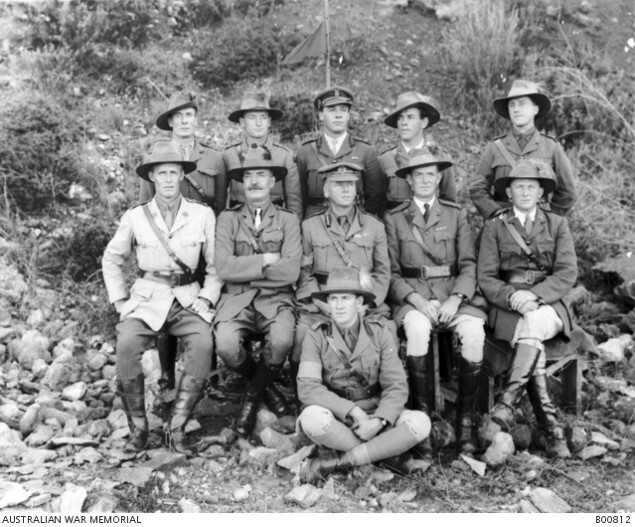 From this time onwards, for the next two months, the 10th Light Horse Regiment remained in continuous combat action until relieved for three months refit and training at Deir el Belah from early January 1918. In early April 1918, the 10th Light Horse Regiment moved into the Jordan Valley and took part in the invasion of Moab and took Es Salt during the action of 30 April – 4 May 1919. 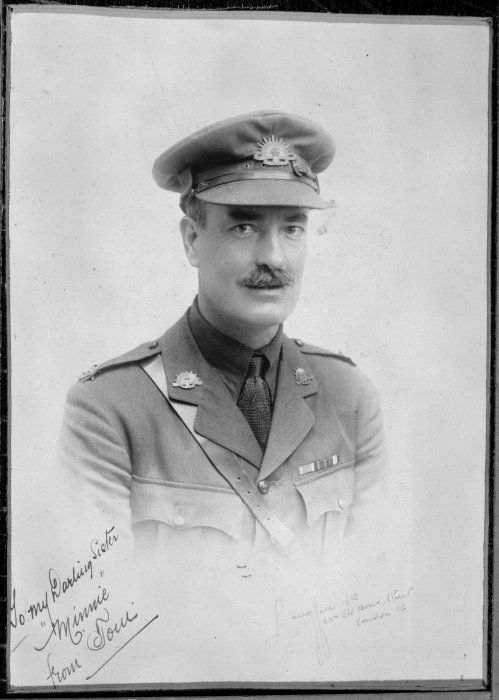 Sadly, Lieutenant Colonel Todd, having lived through the Great War, fell ill and died in Cairo on the 23rd of January 1919. For his services, TODD was awarded the DSO and Bar, and CMG. 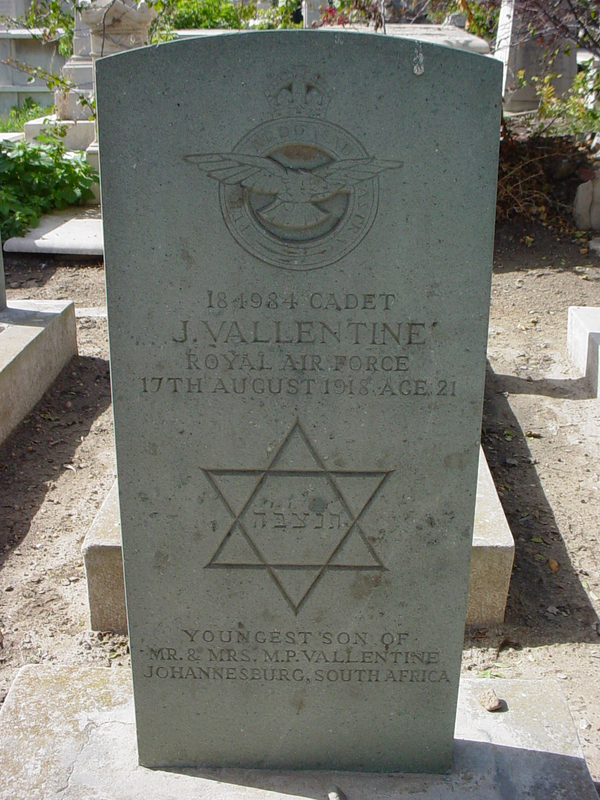 He was laid to rest in the Cairo War Memorial Cemetery, plot Q. 263 after a full military funeral. Pallbearers carrying the coffin to the burial site at the funeral of the late Lieutenant Colonel Thomas John Todd CMG DSO, The Australian War Memorial, B00846 refers. 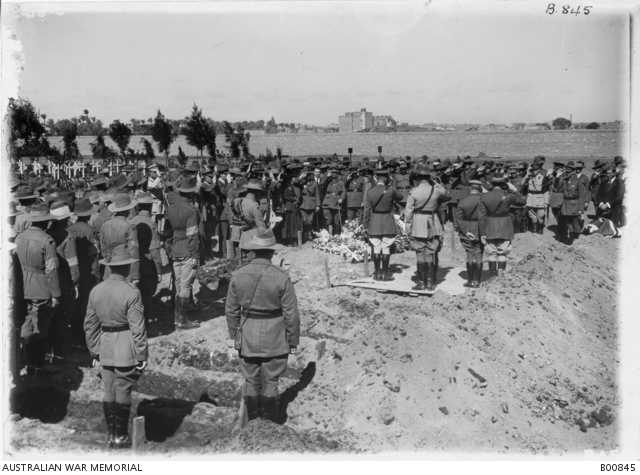 Sounding the Last Post at the funeral of the late Lieutenant Colonel Thomas John Todd CMG DSO, The Australian War Memorial, B00845 refers. 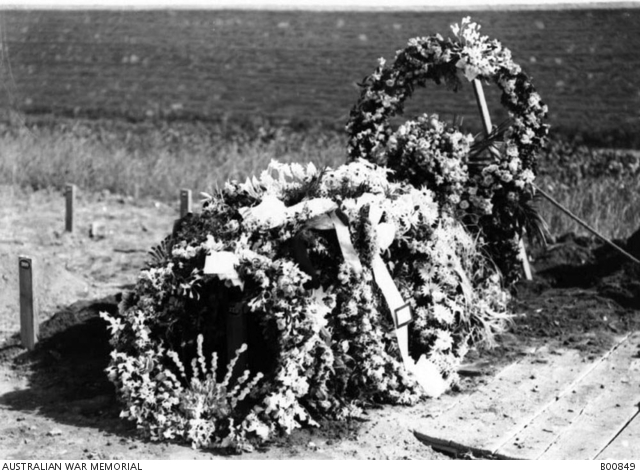 The floral tribute decked grave of Lieutenant Colonel Thomas John Todd CMG DSO, The Australian War Memorial, B00849 refers. 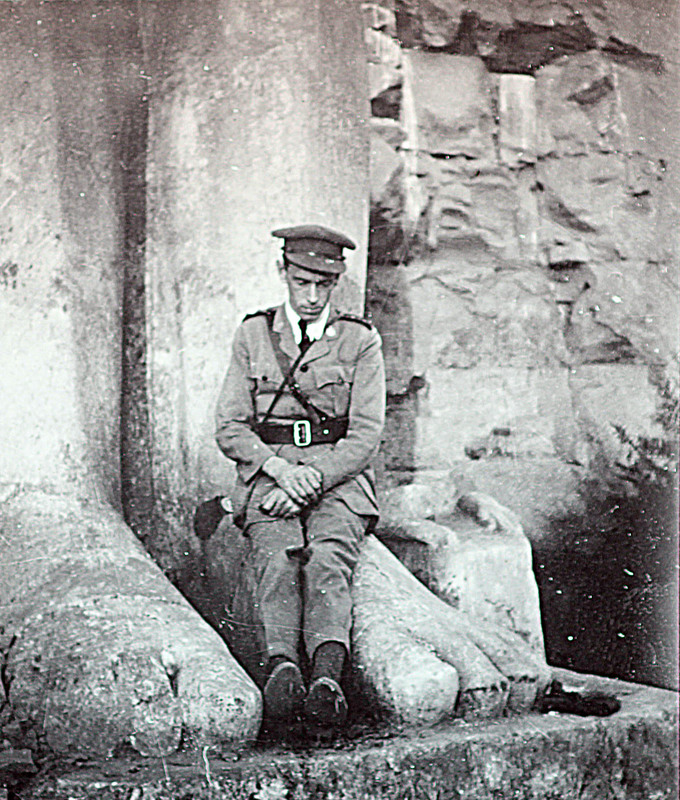 Albert William Hazel, a graduate of Hertford College, Oxford was a long-served Inspector of the Egyptian Civil Service who was awarded the 3rd Class of the Turkish Order of Medjidie sometime prior to the Great War. Granted the local rank of Lieutenant-Colonel in the latter conflict, he was awarded the 3rd Class of the Egyptian Order of the Nile for his ‘valuable services’ (London Gazette 29 December 1916 refers), a civil O.B.E. (London Gazette 7 January 1918 refers), a mention in dispatches by General Allenby (London Gazette 16 January 1918 refers), and, finally, in June 1919, the C.B.E., this latter most probably in connection with his services as an Inspector of Recruiting. Be that as it may, Hazel was no longer around to enjoy the latter appointment, having been murdered near Deirut on 24 March 1919, just a few days after several Europeans met a similar fate at the local railway station – the whole as a result of a violent uprising that resulted in death or injury to some 75 British citizens in the Spring and Summer of that year. He is believed to have been shot. The Colonel, who was aged 42 years, left a widow, Marie Sophia of Oaken, Wolverhampton. 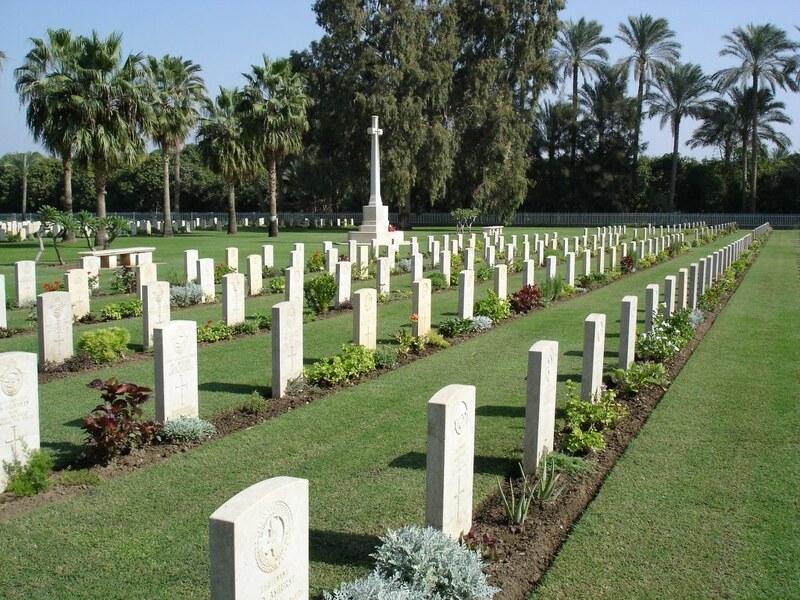 Lt Col Hazel was buried in the Cairo War Memorial Cemetery, plot H. 46. 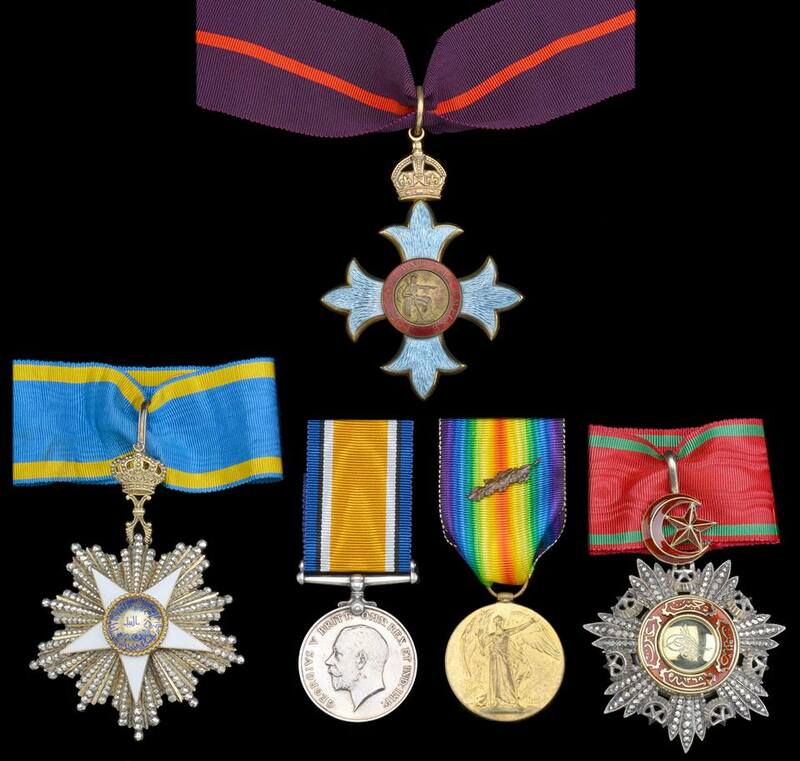 His medal group came up for sale in December 2012 via Dix Noonan Webb with an auction estimate of £700 – £900. A final sale price of £880 was reached, I hope they found an appreciative home. ‘A Great War C.B.E. group of six awarded to Lieutenant-Colonel A. W. Hazel, a General Staff Officer in the Ministry of Interior, Cairo, who was murdered in the uprising of March 1919. Herbert Bowen Hamlin, a Surveyors Assistant, of Narrogin, WA enlisted on the 28th October 1914 into the 10th Australian Light Horse. He embarked from Fremantle on HMAT Surada on 17 February 1915 with 204 men and 230 horses bound for Egypt. After arriving in Egypt in March 1915 the 10th Light Horse set up camp at Mena near the Giza Pyramids and commenced their training. 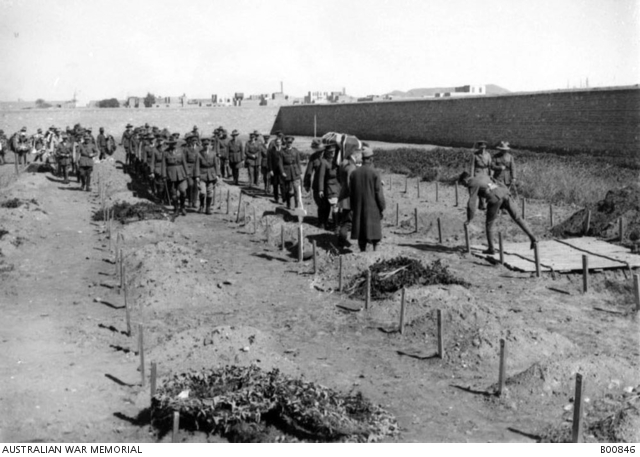 The regiment joined the 3rd Light Horse Brigade in Egypt and served dismounted at Gallipoli. The regiment’s most famous actions were the charge at the Nek on 7 August 1915, and Hill 60 on 29-30 August. After the withdrawal from Gallipoli in December 1915 the regiment was bought up to strength and re organised to defend Egypt from the Ottoman Army advancing on the Suez Canal. A small notice from the Narrogin observer states that Herbert was wounded at Gallipoli and sent home on leave to recover from enteric fever (typhoid). Whilst most sources list him as unmarried he appears to have married Mary Grace Louch during his leave in Australia. Herbert traveled back to the Middle East to rejoin his unit and through 1916 the Light Horse drove the Turks across the deserts of Sinai, participating in the battles of Romani and Magdhaba. In 1917 they were part of the Desert Column that advanced into Palestine. The regiment participated in the bloody battles to break the Gaza-Beersheba line and helped capture Jerusalem. They participated in the Es Salt Raid in May 1918. In August they were one of the regiments re-equipped with swords and rifle boots, and retrained to take a more orthodox cavalry role. In their new role they took part in the rout of the Ottoman army in the Jordan Valley, a campaign the light horse referred to as “The Great Ride”. In September the 10th Light Horse was the first formed regiment to enter Damascus. Although eager to return to his wife and a baby daughter he had not yet seen Hebert remained in Egypt during the 1919 uprisings. 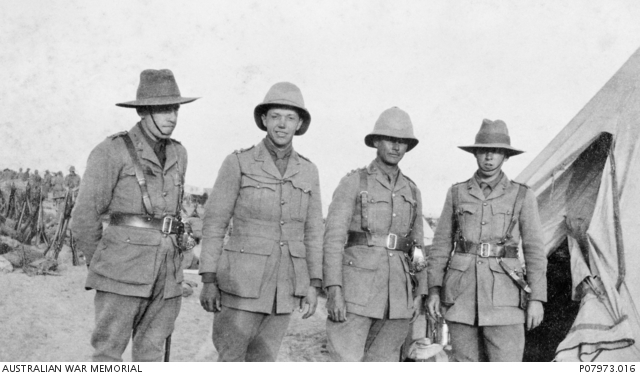 In the absence of a large British force in Egypt, elements of the Australian and ANZAC Mounted Divisions, then awaiting embarkation to Australia, were instructed to restore order. Sadly, Herbert fell ill and died of acute pericarditis on the 30th May 1919. 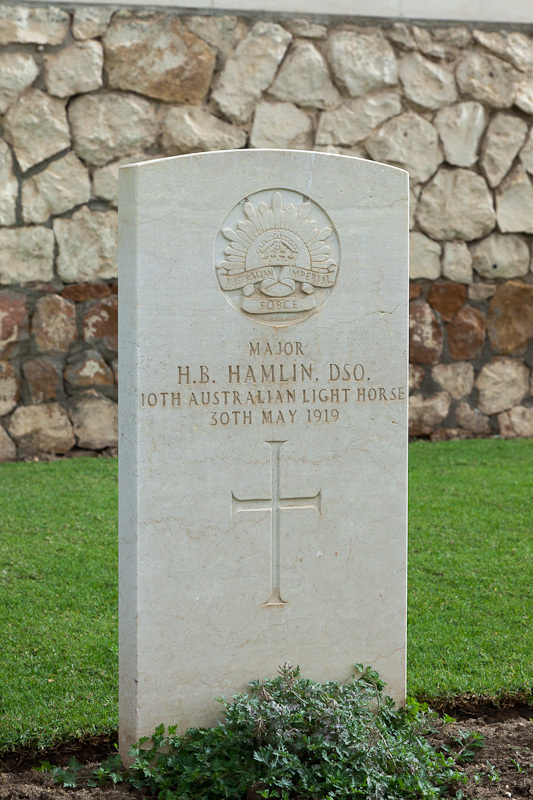 He was buried with full military honors in the Ismalia War Memorial Cemetery, plot C. 28. 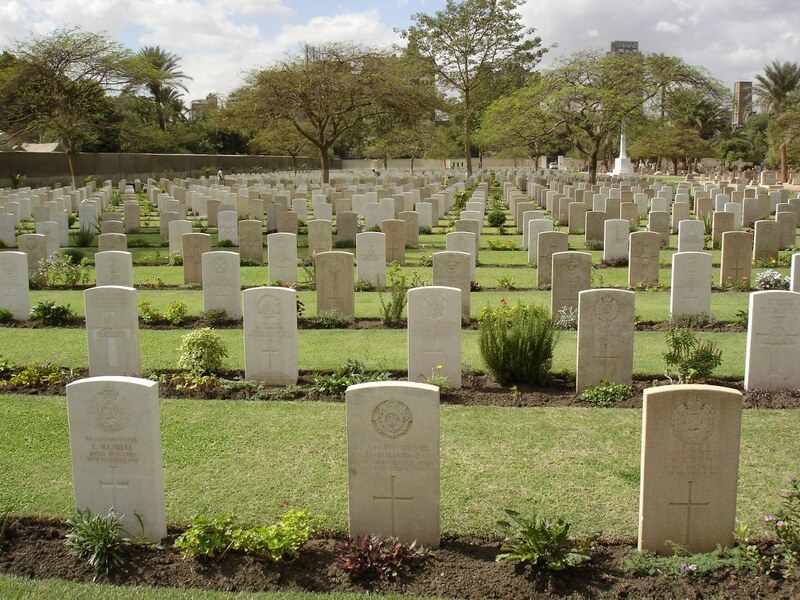 The Commonwealth War Graves Commission maintains 33 sites in Egypt commemorating the lives of over 42,000 servicemen and women in perpetuity. At the outbreak of the First World War, Cairo was headquarters to the United Kingdom garrison in Egypt. With Alexandria, it became the main hospital centre for Gallipoli in 1915 and later dealt with the sick and wounded from operations in Egypt and Palestine. General Headquarters, Middle East Command, was set up in Cairo shortly before the Second World War, remaining there throughout the war years. In any cemetery with over 40 graves you will find a Cross of Sacrifice, designed by the architect Sir Reginald Blomfield to represent the faith of the majority. Cemeteries with over 1,000 burials have a Stone of Remembrance, designed by the British Architect, Sir Edwin Lutyens to commemorate those of all faiths and none. Lutyens based the geometry of the structure on studies of the Parthenon and steered purposefully clear of shapes associated with particular religions. A uniform shape and style of headstone was decided upon in order to represent equality in death. 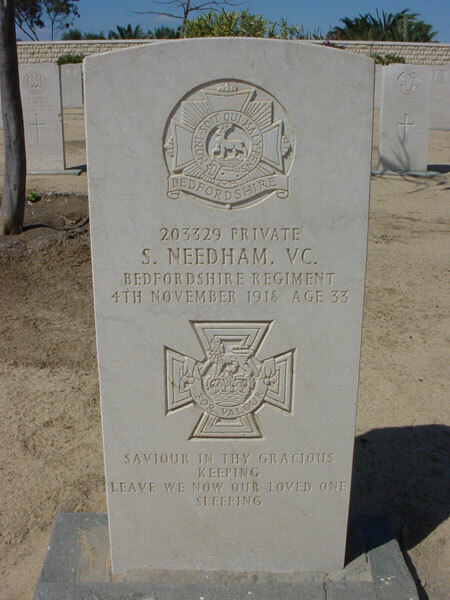 Headstones are made from a material sympathetic to both climate and ground conditions and in addition to a cross and personal inscription, have the soldiers name, regimental number, age (if supplied by the next of kin), date of death and the name and badge of the regiment or corps inscribed. Holders of the Victoria Cross have the medal inscribed on the stone. 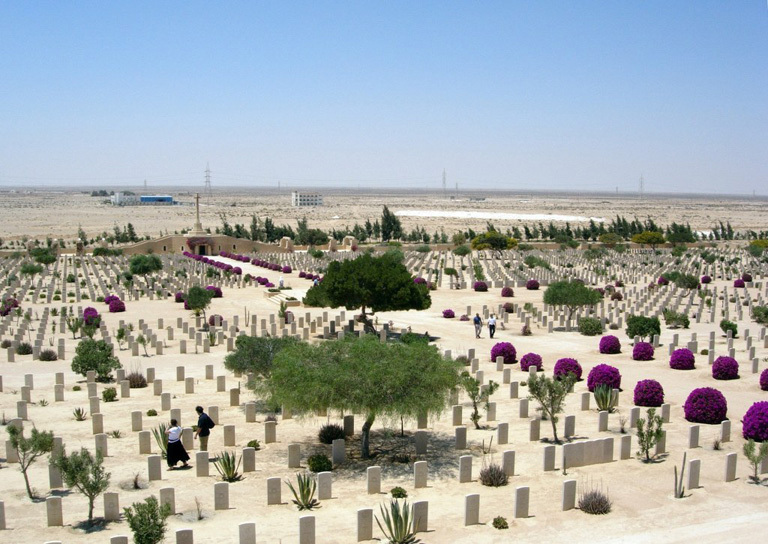 The Cemeteries in Egypt are places of great beauty and character with planting schemes carefully chosen for the Egyptian climate and cemetery location. 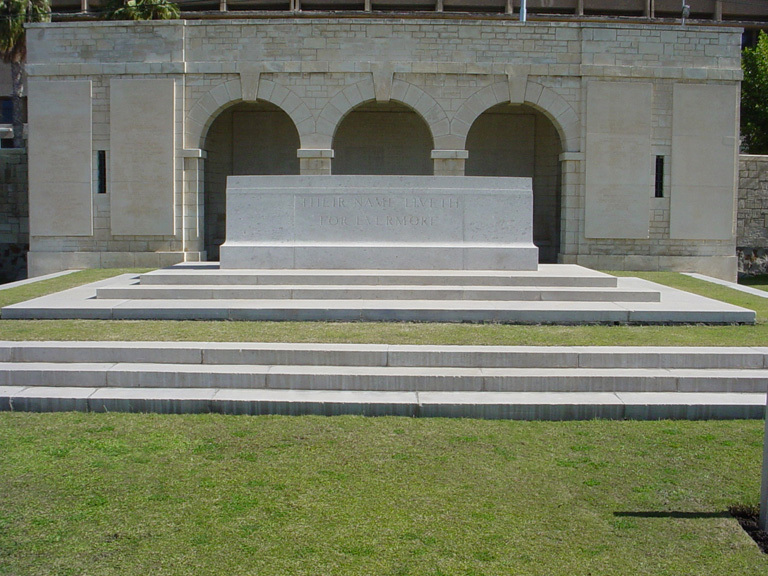 I would urge you to, where appropriate, see these places as they pay tribute to the lives of remarkable men and women. There is much work to be done to document casualty biographies as where possible, each of these men and women deserve to have a ‘face’ and their stories told. I am looking forward to sharing a selection of their stories with you. 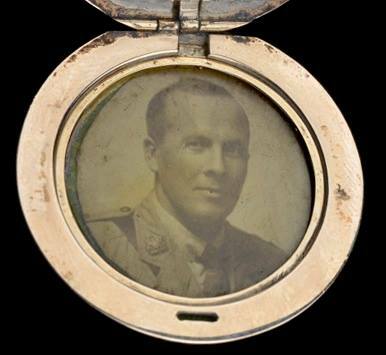 Royston Kenilworth Sydney May, a medical student from St Paul’s College at the University of Sydney passed away on the 16th of May in 1915 after sustaining a bullet wound to his left arm during the course of the Gallipoli landings. The battalion took part in the ANZAC landing on 25 April 1915 as part of the second and third waves, and served there until the evacuation in December. 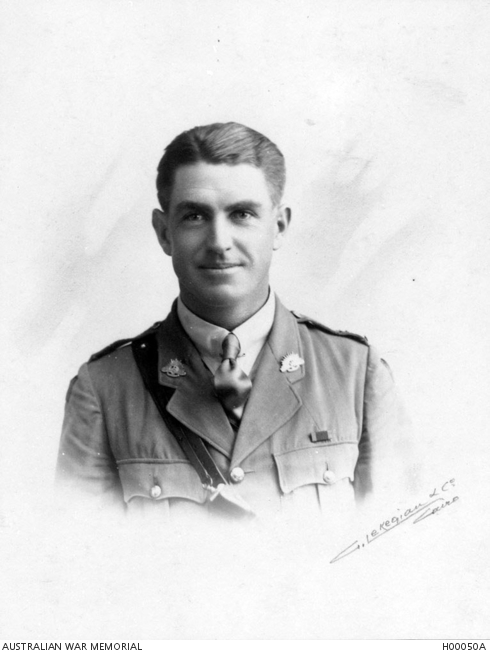 ‘Lieutenant Royston Kenilworth Sydney May, reported wounded, is the only son of Mr Sydney May, chemist, Manly. He was born in 1894, educated at King’s School, Parramatta, where he was a lieutenant in the school corps, and also the holder of the Burton Exhibition Scholarship. He afterwards joined the 34th Regiment, Newtown, with similar rank. 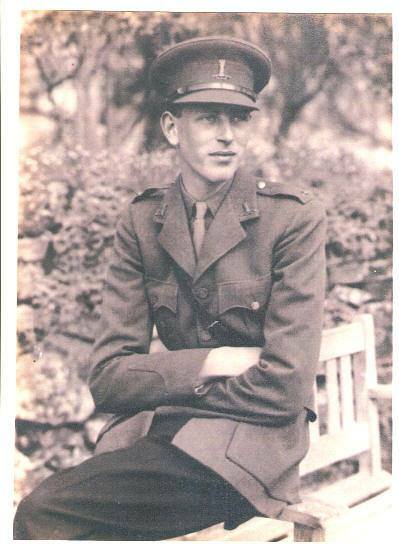 When the war broke out Lieutenant May was in his second year of medicine at St Andrew’s College, Sydney University. He was one of the fourteen King’s School cadets sent to the Indian Durbar, and formed one of the guard for King George during the picturesque and historic event. Lieutenant May took a keen interest in sport, and is a fine all-round athlete’ – Sydney Morning Herald, 10 May 1915. He died of erysipelas as a result of his wound at No 1 General Hospital, Heliopolis, Egypt and was buried in the Cairo War Memorial Cemetery in Egypt.